At the end of the road in an industrial area in the Seattle suburb of Kent looms a half-block of fenced-in hangar-like buildings with no name. This is the headquarters of Blue Origin, the space company owned and bankrolled by Jeff Bezos, the chief executive of Amazon. 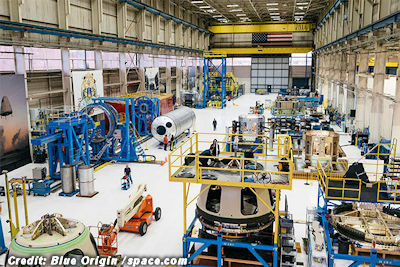 With a few notable exceptions, such as launchings and landings of New Shepard, a reusable suborbital spaceship, the company has shielded itself from the public eye. That changed on Tuesday when a group of veteran space reporters spent four hours touring the plant and talking with Bezos and Blue Origin managers.